Regardless of your needs, Suncoast Inspections can provide the infrared camera Inspections for commercial building, industrial mechanical/electrical systems to residential application inspections. Whether it is a mechanical, electrical, or building envelope issue, our experienced certified staff, with extensive training at the Flir Training Institute in Boston, can meet your needs. Our reports can be generated on site providing you or your client with a fast comprehensive photo based report. See our Commercial Inspection page for examples of our job experience. If you would like to order a consultation, please call (727) 420-8993. Thermography means “writing with heat”, just like photography means “writing with light”. The picture that is generated is called a thermogram or thermal image. Infrared Thermography is the process of acquisition and analysis of thermal information from non-contact thermal imaging devices. That’s a quick explanation, at the bottom of this page is a much more detail explanation. There are multiple uses for Infrared Cameras, from finding roof leaks, plumbing leaks under concrete slabs, leaks in air condition ductwork to checking insulation inside walls and ceilings. Above are two examples of Infrared Thermography. The top right photo is the infrared photo of the water heater in the left photo. 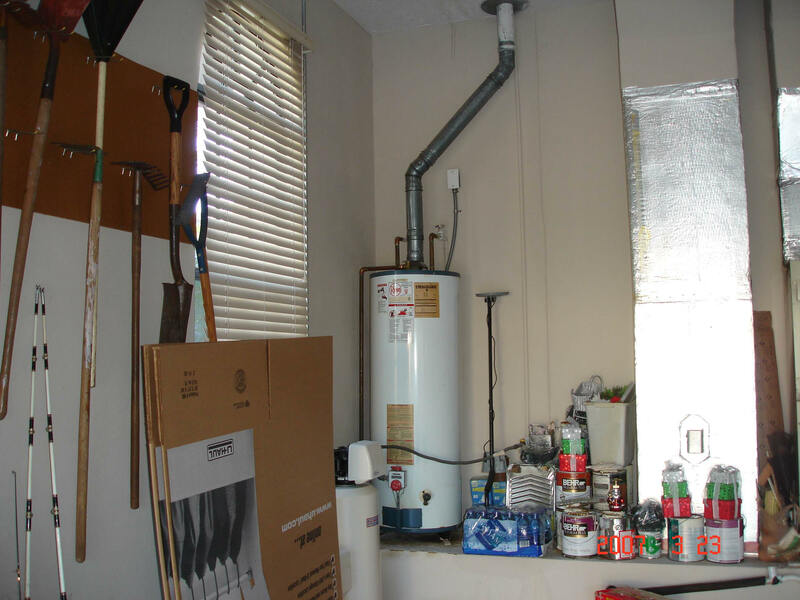 The water heater shows up brighter because of the hotter surface temperatures. The bright white at the bottom is the gas flame heating the water. The lower two photos are of an HVAC condenser, the three red bars running through right to left are the coils heating up from the removal of the heat from the dwelling. If this condenser was malfunctioning there would be breaks in the red bars. SI.com is the only residential and commercial inspection firm in Tampa Bay with a Level 1 Certification. Other inspection companies say they have or use a camera as a “tool” but unless they are certified they do not know how to use the information the camera provides, nor are they able to testify in court as to the camera’s findings. Whether it be commercial, residential or industrial, we pride ourselves on a quick turnaround time and are willing to make special arrangements to expedite the reviews and field reports for our clients. 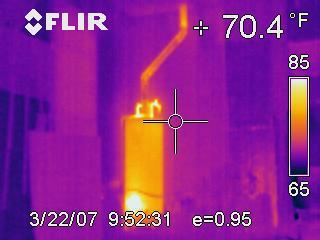 Thermal heat loss inspections for buildings, plants, facilities, refineries. Concrete water heated floor inspections for leaks and temperature distribution. Locate missing or damaged insulation. Identify air leakage energy losses. Evaluate the thermal performance of retrofits. Locate radiant heating wires or pipes. Detect delaminating in concrete bridge decking. Flat roof leak detection for buildings, plants and facilities. Identify water damaged portions of a roof quickly and accurately. Eliminate unnecessary replacement of good roofing. Plan accurate budgets based on facts. Document problems before the warranty/bond expires. 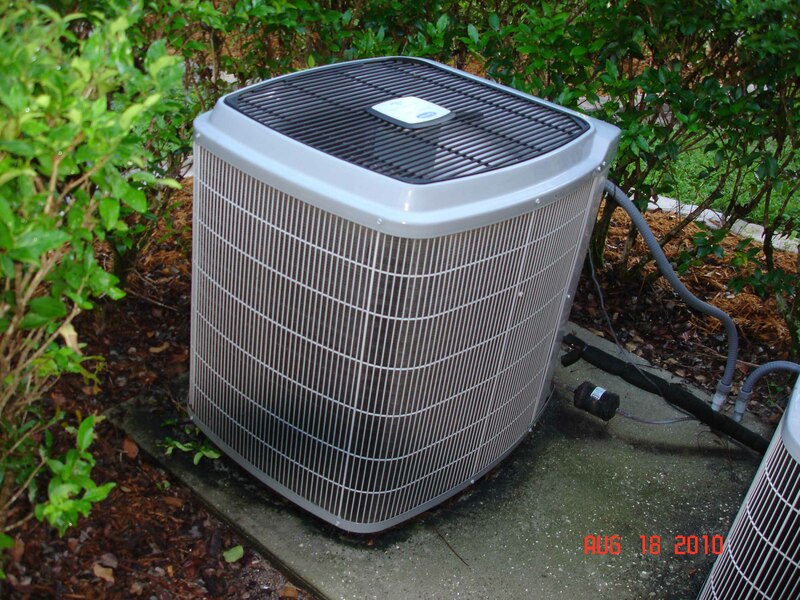 No other inspection company in Tampa Bay has invested this heavily in equipment and education. Our staff has attended the Flirs’ Infrared Training Center in Boston, completing rigorous courses and examination, becoming one of the few building inspectors certified as a Level 1 Thermographer. The reason we decided on this particular piece of equipment verses all the others is the fact that the United States Homeland Security chose Flir after 18 months of rigorous comparisons of all brands. During the training classes we had the honor of sitting next to the purchasing agent for Homeland Security. This alone sold us on the product line. FLIR Systems offers the best infrared thermography training in the industry! The Infrared Training Center (ITC), with headquarters in Boston and Stockholm, and regional training facilities around the globe, is the world’s finest infrared training and certification organization. The ITC’s instructor staff includes ASNT and EPRI Level III certified Thermographer instructors. Guided by the ITC International staff, you will become an effective, proficient, certified Thermographer. Thermography is the use of an infrared imaging and measurement camera to “see” and “measure” thermal energy emitted from an object. Thermal, or infrared energy, is light that is not visible because its wavelength is too long to be detected by the human eye; it’s the part of the electromagnetic spectrum that we perceive as heat. Unlike visible light, in the infrared world, everything with a temperature above absolute zero emits heat. 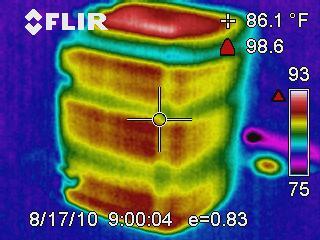 Even very cold objects, like ice cubes, emit infrared. The higher the object’s temperature, the greater the IR radiation emitted. Infrared allows us to see what our eyes cannot. Infrared thermography cameras produce images of invisible infrared or “heat” radiation and provide precise non-contact temperature measurement capabilities. Nearly everything gets hot before it fails, making infrared cameras extremely cost-effective and valuable diagnostic tools in many diverse applications. And as the industry strives to improve manufacturing efficiencies, manage energy, improve product quality, and enhance worker safety, new applications for infrared cameras continually emerge.